Mumbai City FC registered an emphatic 6-1 win over Kerala Blasters in the final game before the mid-season break in the Hero Indian Super League (ISL) at the Mumbai Football Arena on Sunday. The hosts established a 3-1 advantage in the first half courtesy of a hat-trick from Modou Sougou while Seiminlen Doungel pulled a goal back for the visitors. However, Zakeer Mundampara was sent off just before half-time for a second bookable offence and the Blasters played the entirety of the second half on a numerical disadvantage. 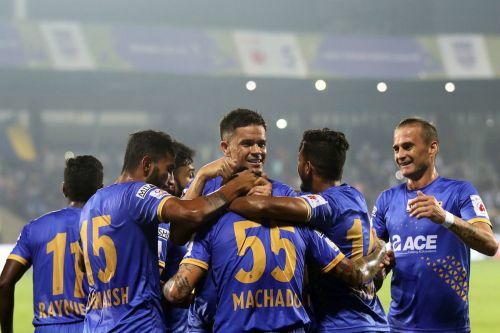 The Islanders took advantage of the situation and piled on further misery courtesy of two stunning second-half goals from Rafael Bastos and Matias Mirabaje before Sougou completed the rout in stoppage time to become the first player to score four goals in an ISL game. The result now means that Mumbai finish the year in second place with 24 points, three behind leaders Bengaluru FC, while it seems like the season could well be over for the Blasters who are now languishing towards the bottom of the table at eighth with just nine points from their 12 games until now. Modou Sougou proved to be too hot to handle for Kerala Blasters as he netted a first-half hat-trick in the space of 18 minutes to condemn the visitors to their fifth defeat of the ongoing ISL season. 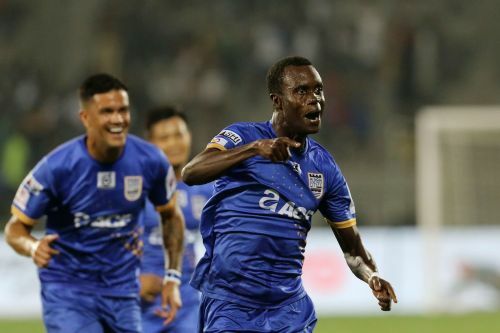 The Senegalese striker was at the top of his game in the first half and established himself as Mumbai City FC’s all-time leading goal-scorer with three well-taken goals that gave the hosts some leeway over their opponents. Despite only joining the club this season, Sougou has now scored more goals for Mumbai City than any other player in the history of the tournament and he opened the scoring in the 11th minute after getting on the end of a cross from Paulo Machado to put the ball beyond the reach of Dheeraj Singh Moirangthem in the visitors’ goal. However, the pick of his goals came just three minutes later, after the Blasters were punished for their lackadaisical approach while playing it out from the back. Raynier Fernandes picked up the loose ball and teed up Sougou, who dispatched an unstoppable shot from outside the area that clipped the underside of the bar before finding the back of the net. Sougou completed his hat-trick in the 30th minute when he got on the end of a cross from Subhasish Bose to plant a header into the back of the visitors’ net to etch his name into the history books at Mumbai City. The 33-year-old even had time for a fourth goal that came in the 90th minute when he became the only player in the history of the ISL to score four goals in a game.